We have new kits in the Knit & Crochet Kits section of the store. You won't want to miss these creative & colorful additions for spring! We've brought back the Felted Easter Eggs & Basket Knit Kit, just in time for spring! This quality knitting kit from Knitwhits includes 100% Peruvian Highland wool yarn, pattern, and instructions for knitting 6 colorful Easter eggs and 1 basket. 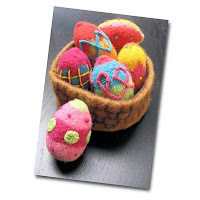 This felted basket filled with eggs would be a bright addition to your Easter decorations. Knitted Easter eggs also make a creative gift for friends & family. This knitting kit is recommended for intermediate knitters. Required skills include knit, purl, and basic fair isle. The Elfin Baby Booties Knitting Pattern & Yarn Kit is a brand new knit kit from Knitwhits. This felted knit kit includes 100% Peruvian Highland wool yarn, pattern, and instructions for knitting these adorable booties for baby or toddler. This knitting kit is recommended for advanced beginner knitters. Required skills include knit and purl. 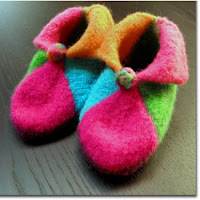 You'll only need to sew one seam to finished these felted booties! 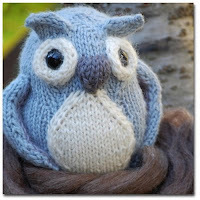 You can make this sweet knitted owl softie with the Bramble Owl Soft Toy Knit Kit from Knitwhits. This softies knitting kit includes 100% wool yarn, pattern, and instructions for knitting this soft grey owl toy. This knitting kit is recommended for intermediate knitters. Required skills include knit, purl, increasing, and decreasing. Your finished owl will be approx. 7" tall. I want to tell you about an excellent knitting resource, helpful for both beginner and experienced knitters. It's called KnittingHelp.com and it's full of free learn to knit videos! Beginners will appreciate the selection of basic knitting videos, including tips and techniques for getting started. There are videos that teach a variety of methods for casting on your stitches - the first step in learning how to knit. Another set of videos will show you how to do the knit and purl stitches. Once you're comfortable with the cast-on, knit, and purl stitches, you'll be ready to learn some intermediate techniques, such as increasing and decreasing. Just click on the View Knitting Videos link to see KnittingHelp.com's full list of video categories. Just take it one step at a time and soon you'll be knitting a variety of projects. Visit Weekend Kits to see our complete selection of Knitting Kits for beginners and experienced knitters. Kits include patterns and yarn to complete your knitting project. Some beginner kits even include the knitting needles. This saves you time and makes getting started on your next knitting project a breeze! Learn to Sew Project Kits - Sew So Simple! Caron Latch Hook Kits for Kids!